I’ve been a strict vegetarian for more than 20 years. Before that, I was a half-assed vegetarian for at least 20 more. In all that time, I’ve frequently researched nutrition, and experimented with and reevaluated my diet. And I’ve always been happy to discuss the matter with people who express an interest, either because they’re vegetarians themselves or because they’re just curious. But there are two things I have not done: I have not criticized anyone else’s diet, and I have never tried to recruit anyone to the “cause”. Not once. I’m annoyed by proselytizers myself, and I know many other people are too. Some people are just as defensive about their meat as they are about their guns or their religion — and often for reasons just as ill-informed and irrational. Just recently, the Gotcha Squad descended on me with accusatory soundbites ablaze (“You’re obviously a so and so who believes such and such”) after I dared mention here in passing that it’s perfectly possible to live a perfectly healthy life without meat — a fact that anyone can readily verify. I was denounced as a pseudoscientific, bigoted, propagandizing mountebank after mentioning a proposed discussion of this topic that I haven’t even written yet! Well, I’m not out to improve anyone’s manners or reasoning skills any more than I’m out to improve anyone’s diet. But I am out to correct misinformation. And there’s quite a bit of it propagated in the name of the meat cause. Accordingly, I’ve been planning for some time now to do a series about popular meat myths. 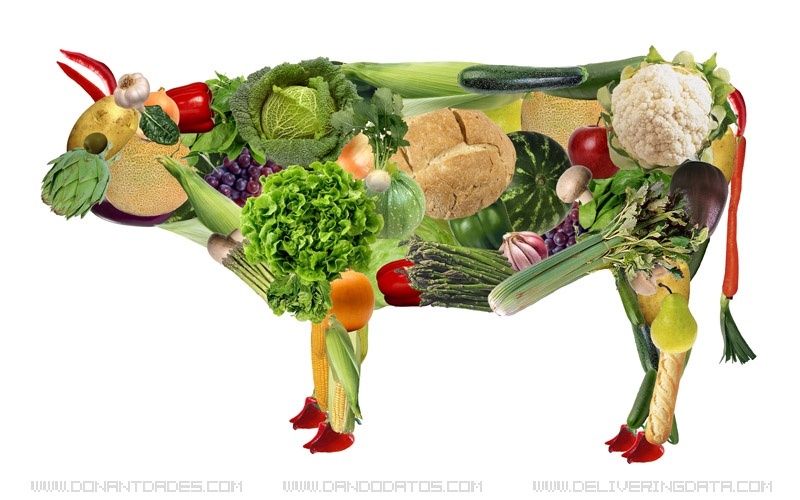 But it seems I should first address the myths about vegetarianism and the people who practice it, as these also have gained a great deal of traction. This became apparent after I read an article called Myths & Truths About Vegetarianism. I’m rather embarrassed to confess that I’ve discovered it only recently, as it’s been around since 2000, and it has become something of a staple among meatsters, a standard piece of propaganda they cut and paste and hurl in the faces of vegetarians with a “chew on that, rutabaga head”. This piece is often transmitted in a digest version that makes its argument even more oversimplified and dogmatic than it already was. The article was written by a doctor, the late Stephen Byrnes, ND. And to many people, that means he must have been an expert nutritionist. As it happens, he was also a registered nutritional consulting practitioner. But I’m going to let you in on a little secret. An astounding, shocking, horrifying, disgusting secret. Ready? Here goes: most doctors receive woefully inadequate training in nutrition. Most medical schools do not even meet the absolute minimum recommended standard of 25 hours. (That’s for the entire 4 years, folks.) In many cases, students receive far less than that — often only three to four hours, even at the nation’s top schools. Dr. Andrew Weill says that he received only ONE hour of nutritional training at Harvard — only slightly more than your plumber or barber. Moreover, the bulk of this training tends to come early in the curriculum, when students are learning basic material. Hippocrates seems to have recognized 2400 years ago that food is medicine; but many medical practitioners today still have not caught up with him. Of course, doctors are qualified to speak about matters of health, which is related to nutrition — whether they realize it or not. But all too often, they’re perfectly content to jump on the conventional wisdom bandwagon, and recommend that everyone eat meat because that’s just the way things are done. It may not always be fair to judge people by the company they keep, but it may be useful to note that Dr. Byrnes republished his article for the Weston A. Price Foundation, of which he had been a board member, an organization often denounced for quackery that advocates, among other things, the consumption of raw milk and large amounts of animal fats. It was named posthumously after a dentist, Dr. Weston A. Price (1870-1948) who developed some unorthodox theories of nutrition that earned him a quack badge himself. The interesting thing is that his nutritional recommendations were rather different from those of the organization that purports to honor his legacy. Despite all of this, Dr. Byrnes does manage to include some accurate and useful information. He is quite correct in pointing out, for instance, that vegetarians, and particularly vegans, run a greater risk of vitamin B-12 deficiency, which can have some serious consequences. But he is quite misguided to shoehorn that bit of information into the premise that we absolutely must eat meat in order to survive and thrive. The B-12 problem is an interesting and important one, and it isn’t quite as simplistic as Byrnes and other flesh pushers would have you believe. We’ll be examining it in a little more depth in the future. There are several environmental and socioeconomic concerns about the livestock industry — it contributes as much as 22 percent of greenhouse gases, for instance (yep, that cheeseburger is producing a big chunk of climate change). But Dr. Byrnes chose to ignore these (other writers he quotes give them a cursory nod) and just focus on the “myth” he thought he could dispose of handily. His conclusion is that grazing land “is being put to good use”, but the case he presents is very far from convincing. He is correct that only about a third of the earth’s dry land is being used for agriculture, and that only about a third of that (some 11 percent of the total land mass) is used for growing crops. But this does not mean, as he suggests, that little of the remaining land could be used for crops. With today’s technology, cropland has been established in deserts and other areas that once might have been the most unlikely of farmland. In fact, the increased demand for crops to feed a growing population has led to cropland expansion that has embraced deforestation and other practices that have an additional negative impact on the environment. If land is suitable for large-scale ranching, then chances are it’s either suitable or adaptable for farming as well. Furthermore, at the present time, there is more than enough food grown in the world to feed all people on the planet. The problem is widespread poverty making it impossible for the starving poor to afford it. Even if perfectly true, how does that alter the equation between the land used for meat versus the land used for crops (except for emphasizing that meat is more expensive)? And while acknowledging the prevalence of “business-besotted farmers running intensive livestock units, battery systems and beef-burger bureaucracies”, he insists that ranching when “properly practiced” will not damage the environment. Ah, but there’s the rub. Those alliteratively described “business-besotted farmers” [ranchers] are almost inevitably the norm when there is such a rapacious global appetite for animal flesh. Meat producers, like many other business owners, want to maximize their profits. He quotes another author who states that “[s]ince ancient times, the most destructive factor in the degradation of the environment has been monoculture agriculture.” That may have been true in “ancient times” when there were no factories or automobiles, but today? Furthermore, farming need not be monoculture, and ranching is quite likely to be. The fact is that over two-thirds of the feed fed to animals consists of substances that are either undesirable or completely unsuited for human food. Yes, but one reason is that a portion of the land is designated specifically for raising feed for animals rather than humans. And he notes that animals are a “renewable resource”. Okay, but what does it take to “renew” them? Furthermore, as reported in The Guardian, leading scientists at the Stockholm International Water Institute have issued a projection that is quite at odds with that of Dr. Byrnes — who somehow neglected to mention that livestock production also requires massive quantities of water. These scientists’ projection is also even more apocalyptic: the worldwide population, they warn, may be compelled to embrace vegetarianism by 2050 in order to prevent catastrophic global famine. Notice, by the way, how Dr. Byrnes slyly reframes the issue, shifting from a question of whether meat production has preventable disastrous consequences to a question of whether vegetarianism can eliminate world hunger. In so doing, he sets a very high bar that meatism itself has been failing miserably to attain for quite some time. This tactic is not at all uncommon among people who want to ridicule vegetarianism; they redefine its success in terms they believe it inevitably will fail to satisfy. We just might be seeing more of this tactic in future discussions. I eat food. I eat what I want when I want. Sometimes I want meat, sometimes I want beans, sometimes I want roots and berries. Linking food to rewards and treats, eating things because they are “healthy” and following diets are all signs of eating disorders. I also am not very worried about what might or might not happen by 2050. If food shortages actually became a worldwide problem I would expect that meat production costs would be so high that nobody would be able to afford it anyhow. I would also point out that many other disasters are waiting in the wings and whether we can afford to eat meat or not might be very low on humanity’s list of concerns 35 years from now. I also don’t feel that the question of whether one eats meat or not is of primary importance to human survival , but since cattle require so much land, much of which has been stripped of trees and vegetation in areas like the Amazon basin, large cattle farming does pose as a threat to containing global warming and keeping the planet’s climate healthy–not to mention the methane producing wastes! We have also evolved from genetic ancestors who thrived on a broad and diverse diet—(we still have the incisors we inherited from them. But of course we can also survive quite handily on non-meat energy sources. I have always remembered what was said by Yogis who follow strict vegetables and fruit diets—that when animals die in slaughterhouses, their fear releases adrenalin into their blood streams that can affect our inner calmness, and cause aggressiveness in those who eat their flesh. We do know that our mind body relationship means that we are what we eat, often mentally as well as physically. Then there is the fact that when we eat fellow creatures who are not that far removed from us on the evolutionary scale, it can seem barbaric at times. Most of us would upchuck in response to eating dogs or horses. This reaction is influenced by cultural backgrounds but perhaps also just by human commonality with our fellow creatures. Since I have always liked burgers, steak, and chicken etc. I will probably never give up meat until I am forced to by some socio-ecological influence that makes its benefits not worth its detriments. That’s what happened with my beer and cigarette consumption, so I do also recognize that there are direct benefits received from giving up some types of indulgences–both health and money wise! This is not that interesting a topic for me, but I realize it is truly interesting to many consumers.I also doubt the benefits of eating no meat at all, since evolution wise we are all omnivores! Thanks anyway, POP. I appreciate your research. There are some other posts on this website that do not grab my attention as much as some others do, but that doesn’t mean they aren’t valuable to discuss. Even if I am not greatly interested, there will certainly be others that are. And, I may grow more interested, (or not) just by considering their personal input.